My first book was released by the Himalayan Institute Press on September 25, 2007, and is now in its second printing! The book, Downward Dogs and Warriors: Wisdom Tales for Modern Yogis reveals the relationship of Indian mythology and images to many familiar yoga poses. I wrote this book to share suggestions on combining asana with journaling as a form of contemplative practice, and to share my love for the yoga tradition with other students and teachers. Downward Dogs and Warriors de-mystifies traditional India stories of gods and goddesses by showing their connection to universal human emotions. Connecting these stories to common yoga poses opens a deeper dimension of practice. Use the link below to order your copy using Paypal. Yoga Journal Review – March 2008, pages 120 & 122. Asana has roots far deeper than the ones that you create by pressing through the four corners of your feet. But unless you’re a yoga scholar or consider it your hobby to wade through ancient yogic texts, you might not know the whole story behind your favorite poses. 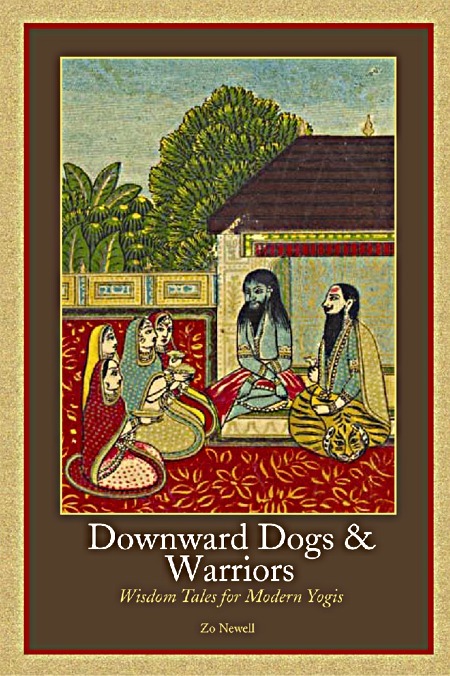 In Downard Dogs & Warriors, Zo Newell offers a CliffsNotes version of the Indian tales that first inspired the asanas practiced today. For example, did you know that Virabhadrasana (Warrior Pose) was named for a god who embodied Shiva’s anger after the wrongful death of his first wife, Sati? Trikonasana (Triangle Pose) may look like a pose named after a simple three-sided shape you studied in geometry, but it also represents the Hindu deities Brahma, Vishnu, and Shiva (the gods of creation, preservation, and destruction), the three Ayurvedic doshas, and the three gunas (qualities of nature). Zo Newell talks about her book Downward Dogs and Warriors.